Only 20 kilometres off the southwest coast of Bali, this island paradise is no longer just a day-trippers’ attraction, but has become a popular holiday destination in its own right. Uncrowded white sand beaches, excellent diving and snorkelling, along with world-class surf breaks, makes Nusa Lembongan the ideal destination for families, extreme sports enthusiasts or anyone looking to have an island experience without the hustle and bustle of neighbouring Bali. The pace of life here may be slow but there’s still a wealth of things to see and do. So when you’re not relaxing on the beach or diving with manta rays and mola-mola, there are cliff-top walks, magnificent views, mangrove forests, Hindu temples, seaweed farming and some of the most stunning sunsets you’ll ever see! Though some of the accommodation may seem dated, a string of new resorts has put the area back on the map – and when the day-trippers leave around 3pm, it’s still a very pleasant spot, with a great white sandy beach and various beachside restaurants. Most of the action takes place on or around the two west coast beaches: Jungut Batu used to be the main haunt for backpackers and surfers – with its range of guesthouses, restaurants and cheap eateries – but with the recent development of the hillside (Bukit) and the addition of upscale villas along the sunset coast, this area is fast becoming the main attraction and provides some of the best accommodation on the island; Mushroom Bay, to the southwest, caters more to families, couples and those wanting to get off the beaten track. So if you’re looking for a place to relax, with little traffic and virtually no hawkers to hassle you, this piece of paradise is only a short boat ride away and waiting to be explored. If you are wondering where to go on Lembongan you can check the best things to do, places to visit, recommended restaurants & bars and nightlife in Lembongan below. Beaches – Aside from the main beaches of Jungut Batu (definitely the spot for sunsets) and Mushroom Bay, Nusa Lembongan has some spectacular Robinson Crusoe-like beaches waiting to be discovered. The secluded Dream Beach, with its powdery white sand, is a wonderful place to spend the day; there’s a great bar/cafe too. Sandy Bay, just to the north of Dream Beach is a small but spectacular beach, with white sand and crashing waves; at low-tide there’s even a dramatic cave to explore. You could also try Tamarind Beach. a beautiful place for swimming, relaxing, snorkelling and surfing. Puncak Sari Temple – On a hill between Lembongan Village and Jungut Batu sits the largest and grandest Hindu temple on the island, affording impressive 360° views back over the strait to Bali’s east coast and of neighbouring Nusa Ceningan and Nusa Penida…. don’t forget to bring your camera! Gala-Gala Underground House – Taking 15 years to complete, this incredible underground labyrinth is one of Nusa Lembongan’s most unique attractions. Built by Made Byasa – using only a hammer and chisel – this underground dwelling covers an area of some 500m² and includes a bedroom, dining room, kitchen, bathroom and sacred meditation room. Devil's Tear – Check out the power of the ocean at this rocky outcrop on the south west coast, as forceful waves crash against the rocks sending plumes of water into the air. There are several blow holes as well, which create dramatic and awe-inspiring scenes when large swells crash into the cliffs. Mangrove Forest – The north eastern part of the island is dominated by an extensive forest of mature mangroves that can be explored in a jukung outrigger boat; with the pleasant Mangrove Restaurant being a good starting point. Boats/tours can be arranged locally through most hotels/guesthouses. Seaweed Farms – Supplying mostly the Asian cosmetics industry, well established seaweed farms can be found in many parts of the island. Dramatic tidal swings make for ideal farming conditions and you’ll often see the local people harvesting their ‘crops’ in the shallow waters along the southern coast. Next to tourism, this is the main source of income for the local people. Suspension Bridge – For an Indiana Jones-type experience, this quirky yellow suspension bridge is a sight not to be missed. Crossing this rickety bridge (by foot/bike) brings you to the tiny island of Nusa Ceningan that mainly attracts visitors to its central ridge for stunning sunset views back across Nusa Lembongan and Bali. 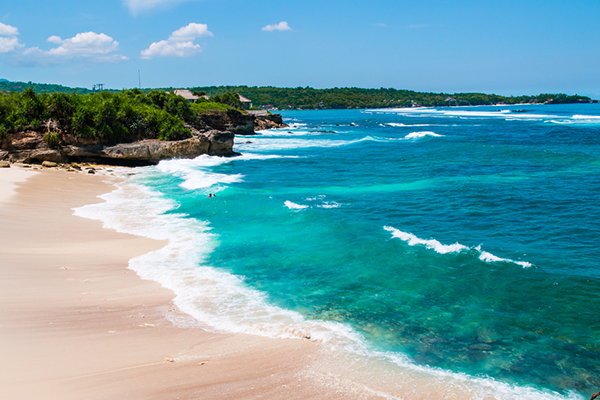 Its notable surf breaks also attract surfers away from the more crowded waves on Nusa Lembongan. Dive with giants - The vivid aqua-blue waters around Nusa Lembongan are some of the clearest you’ll find anywhere. Together with an abundance of marine life, healthy colourful coral and the prospect of seeing some of the oceans more elusive giants, it’s no wonder more and more divers are being drawn to its waters. Along with neighbouring Nusa Ceningan and Nusa Penida, Nusa Lembongan has been declared a ‘marine protected area’ which has led to it becoming a world famous diving destination. Get special diving discounts when you book a fast boast with Gilibookings.com. For experienced divers, the strong currents bring with them large manta rays (all year round) and huge oceanic sunfish (mola-mola) in season (July to October), along with a variety of sharks and other pelagics. For beginners, the numerous reputable dive centres offer all levels of diver training and, along with the Gili Islands, it’s becoming a popular place to gain certification. Explore the Island by Scooter - With a myriad of tracks criss-crossing the island, the best way to explore Lembongan is by renting a Scooter to drive around. The low limestone cliffs in the south offer some splendid coastal views, where you can stop to enjoy the crashing waves & stunning sunsets. DRIVE CAREFULLY as Lembongan's tracks and roads can be full of potholes and slippery loose gravel. Wear closed shoes to avoid injury! Snorkelling - There are plenty of snorkelling opportunities around Nusa Lembongan with gear rental readily available. Although there’s some nice snorkelling right off the beaches, best is to opt for an organised snorkelling trip offered by the operators on Jungut Batu beach or through one of the dive centres. By far the most popular destination is Crystal Bay over on the west side of neighbouring Nusa Penida. The pristine coral, white sand bottom and incredibly clear waters has made this site not only famous with snorkellers and divers, but also with underwater photographers and marine biologists. Surf’s up! - Long established as part of the Bali surf circuit, Nusa Lembongan is extremely popular with experienced surfers and is renowned for its 3 world-class breaks, Shipwrecks, Lacerations and Playgrounds, which are all easy accessible from the beach – either with an energetic paddle or by local boat for a more leisurely approach. Breaks are better suited to more experienced riders as they all break over coral reefs, with Playgrounds – as the name suggest – being a little more forgiving and accessible to beginners as well. Generally best at higher tides, waves can be surfed all year round but can become extremely crowded during the dry season (April to October). The Beach Club (@ Sandy Bay) – Probably one of the best places to dine on the island. Expect stunning views, great service and high quality food and wine, along with their signature daily evening barbecues. They even offer a pick-up service from your hotel or villa. Ketut Warung – Situated just behind the Mainski Resort in Jungut Batu, this family run eatery is a true local treasure. It’s best known for their delicious Thai curries and soups, as well as generous plates of Indonesian food, all at really cheap prices. Mangrove Restaurant – Serving tasty Indonesian and European meals, this Robinson Crusoe-style structure overlooks the beach at the eastern end of the mangrove forest. Muntigs Bar & Restaurant (@ Batu Karang Resort) – Setting itself apart from the other island restaurants, you can expect fine dining with a good variety of international and Balinese cuisine along with a good selection of imported wines. Prices may be a little higher than elsewhere but it’s worth it. Café Bali – Great spot on the beach at Mushroom Bay with simple good quality food at reasonable prices; especially good for lunch. D & B Warung – Best known for their delicious pizzas, this simple restaurant in Jungut Batu also serves the usual Indonesian dishes; exceptional value and great quality. Nyoman's Warung – Heading out of Jungut Batu, on the island’s north shore, this family-run place serves traditional seafood dishes in an informal and relaxed setting. The menu changes daily to reflect whatever Nyoman’s husband has caught that morning. Enjoy special offers which can all be selected when you book your fast boat ticket with Gilibookings.com. Nusa Lembongan isn’t really known for its nightlife, with bars usually closing around 10pm. During the high season beach parties are sometimes organised, along with the occasional full moon party. Scooby Doo Beach Bar – A favourite with Australian surfers, this is one of the more popular places on the island and the best place in town to watch live sports action. Play pool, socialise and grab another cold beer while listening to the latest MTV hits. Blue Corner Bar – Quickly becoming an infamous island hangout, this relaxed bar is located right on the beach in front of the Blue Corner Dive Resort. Playing host to the island’s Friday-night parties, and popular with the expat and diving communities, you can party here with a beach fire and drinks until very late. Surfer Beach Café & Bar – Another popular cosy beach bar that gets quite lively at night, with cheap happy hours, pool table, surf memorabilia and impromptu jam sessions by the talented bar staff. The only way to reach Lembongan other than by helicopter is by boat. Luckily this means that there are several boats within different price ranges going to and from Lembongan. An Island hopping ticket is offered by Scoot Cruise, allowing you to stop over on Lembongan for a few days on your way to or from the Gili Islands or Lombok. Most of the boats from Bali to Lembongan depart from Sanur beach but the exact arrival and departure point depends on the tide. Taking a boat from Lembongan usually means you will get your feet wet while boarding the ship. A larger fast ferry leaves from Benoa Harbour and sails to a floating pontoon just off Jungut Batu beach. From there, passangers are transferred on to smaller speedboats to the Lembongan beach for disembarkation. We advise booking your fast boat in advance through our easy to use homepage search box. This will avoid dissapointment on the day as most services tend to fill up well ahead of departure, especially in peak season months (Jun-Sept & Dec). In addition, cheaper options for boat tickets can be found on Gilitickets.com, our best of budget sister site.